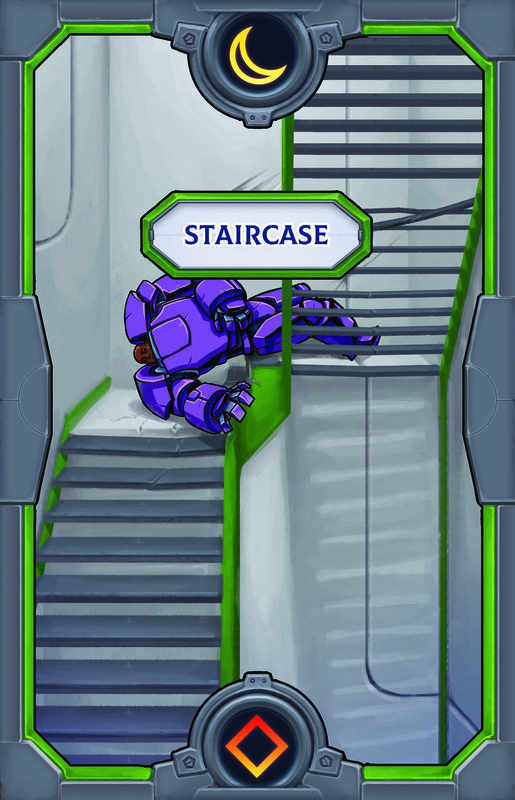 Action: Play the top card from the discard pile. 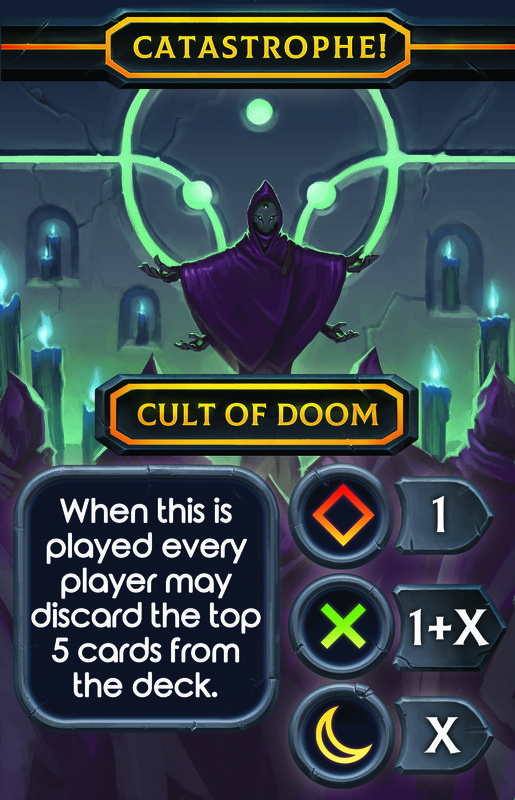 Additional notes: Players discard cards in turn order, starting with the player that initiated the discarding effect. 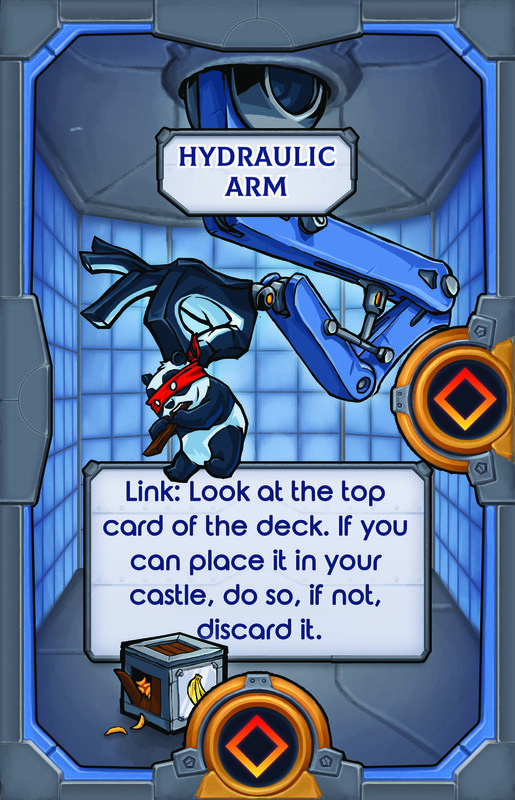 If a player discards multiple cards they may choose the order in which they’re discarded. Action: Look at the top 5 cards of the deck. Play one, put the others back on top. Additional notes: You may play a Disaster. You may place the cards back in any order. 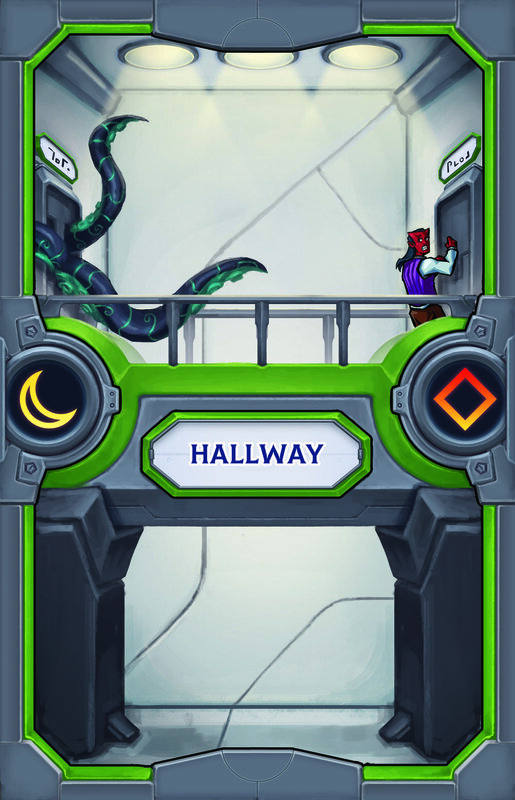 Action: Swap one of your rooms with an outer room of an opponent. Additional notes: As always, placement rules must be respected at all times. Your room doesn’t have to be an outer room. Action: Swap two rooms of an opponent. Additional notes: As always, placement rules must be respected at all times. Both rooms must be and stay in a single players castle. 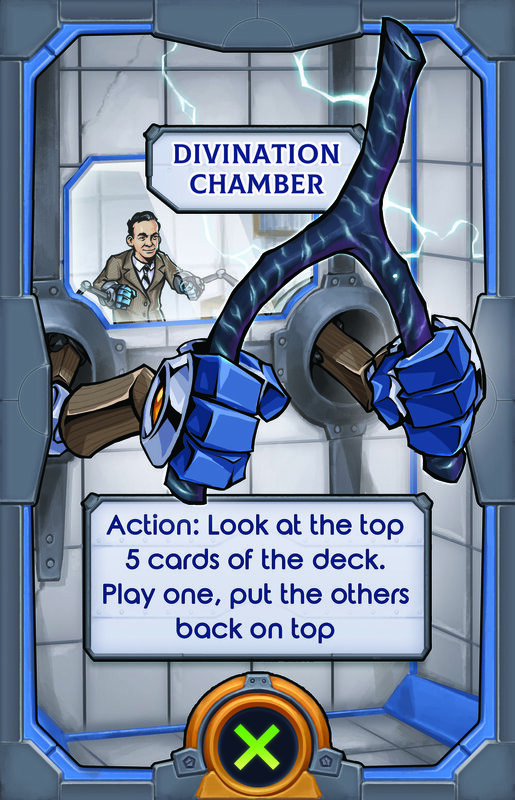 Action: Discard the top 10 cards from the deck. Play any discarded Disasters. Additional notes: Disasters are played in the order they’re drawn. Additional notes: You may rotate a room in any players castle, not just your own. Action: Play the top card from the deck. If you can’t play it, discard it. Additional notes: If a Disaster is drawn, it’s played. Action: If a disaster is drawn before your next turn, take three less damage. 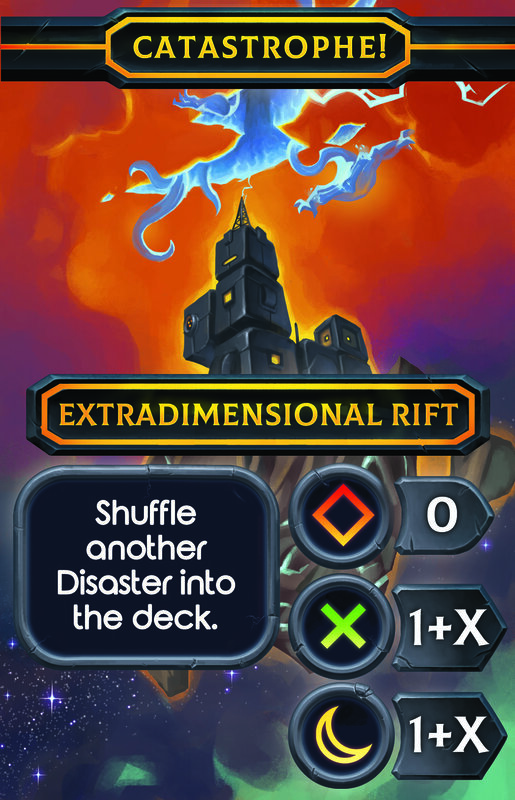 Additional notes: This effect can reduce the damage from multiple Disasters if more than one is drawn before your next turn. 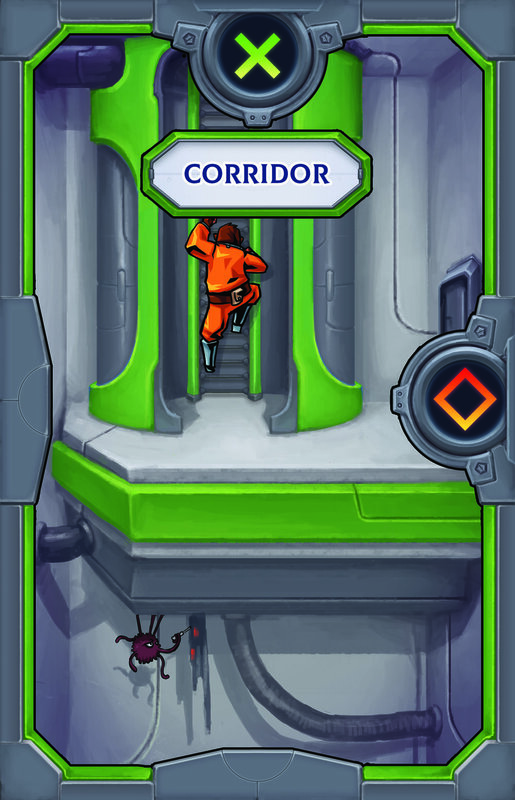 Action: Move up to three of your outer rooms. Additional notes: The rooms have to be moved one after another. 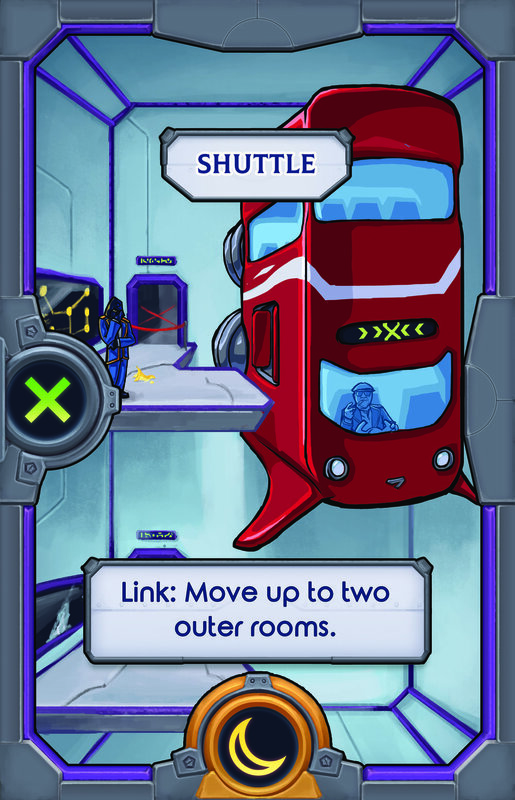 For example a room 1 is not an outer room because it’s connected to an outer room 2. You may move the outer room 2, which then makes room 1 an outer room. You may then move room 1. 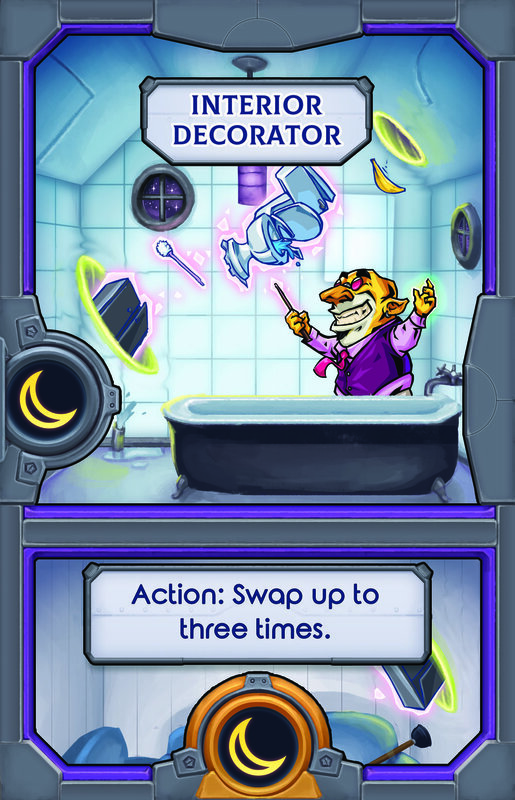 Action: Swap up to three times. Additional notes: You may only swap rooms in your own castle. 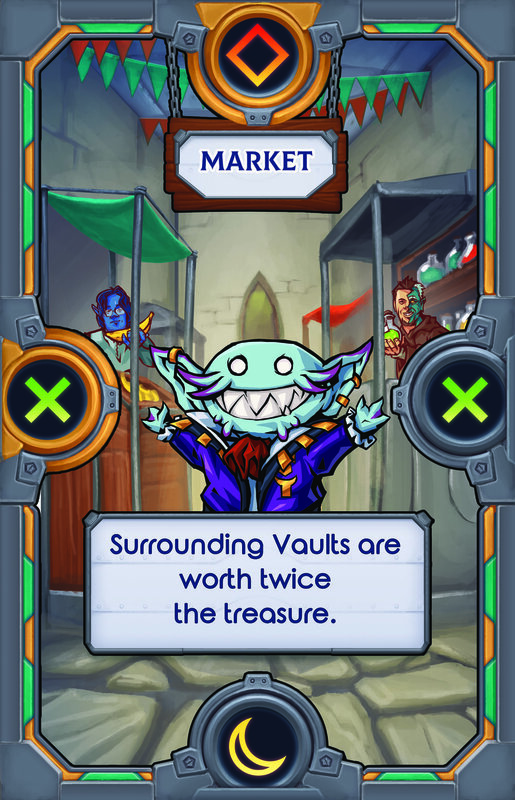 All your Vaults are worth one more treasure. 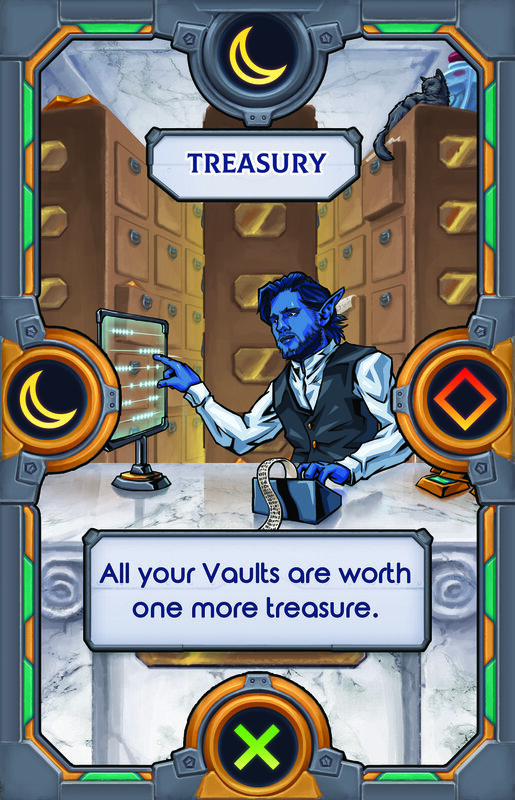 Additional notes: This only applies to active vaults. 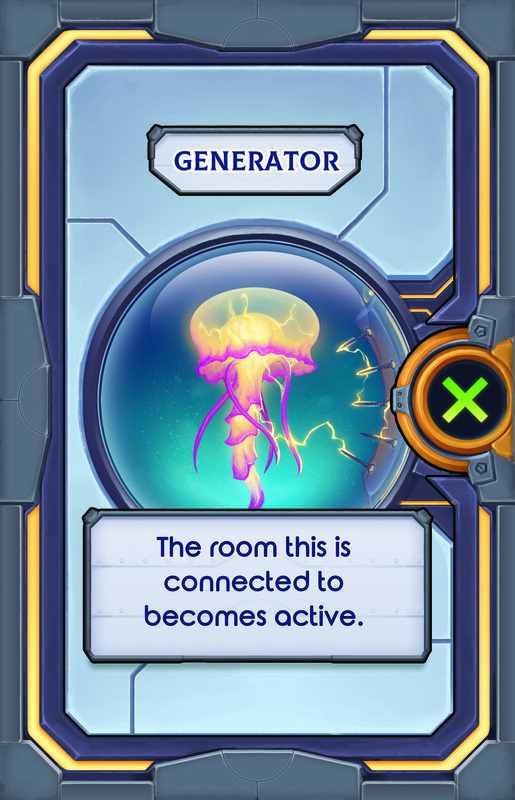 Additional notes: The connected rooms don’t need to meet any of the other usual conditions to become active. Before you place a room, rotate it. Additional notes: As always, placement rules must be respected at all times. This room’s connections count twice. Surrounding rooms can’t be moved or swapped. Additional notes: They can still be rotated. This effect applies to all players, including you. 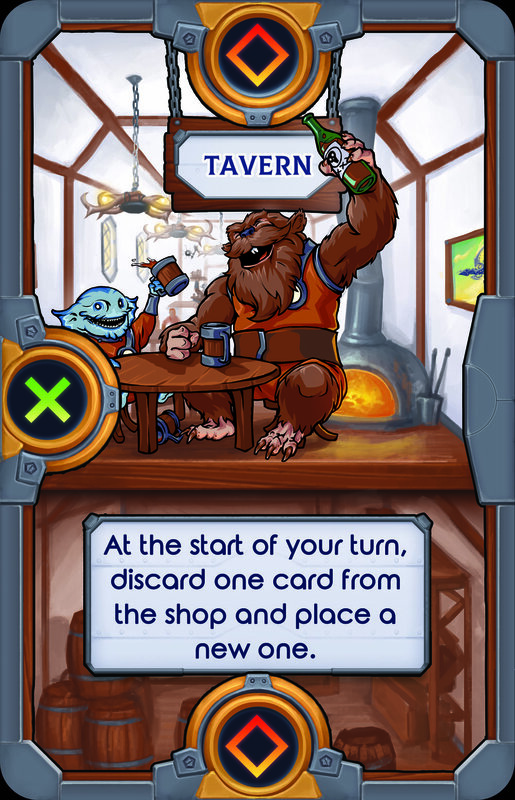 At the start of your turn, discard one card from the shop and place a new one. Additional notes: You may choose which card to discard. 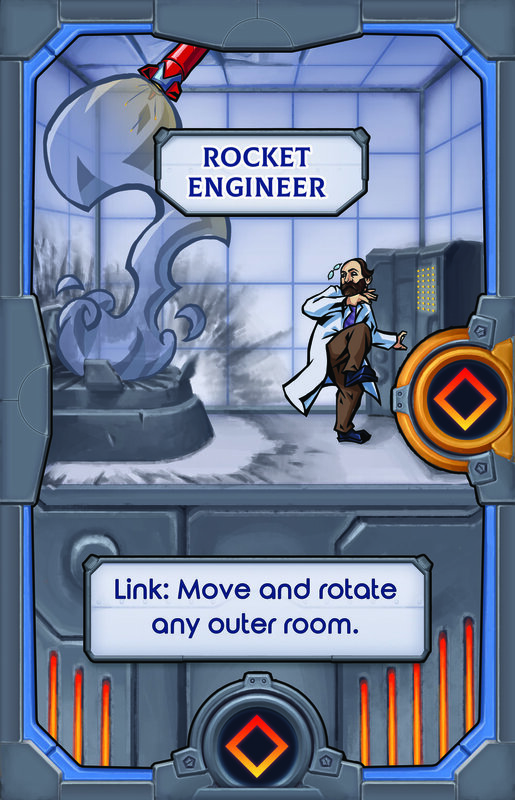 When a link connected to this room is activated: use it twice. Additional notes: If the link states you “have to” use it, then you also have to use it twice. Else you may only use it once or not at all. The room this is connected to becomes active. 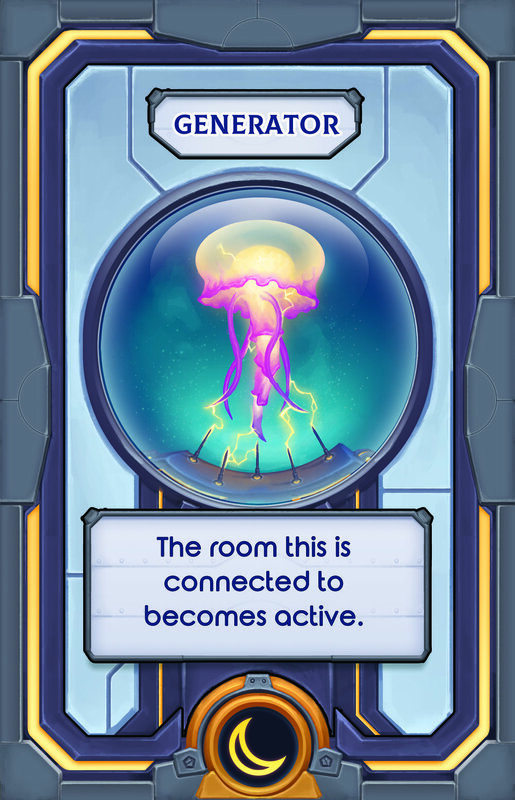 Additional notes: The connected room doesn’t need to meet any of the other usual conditions to become active. Take one less damage from disasters. Additional notes: Apply this effect after all the other Disaster damage calculations. Take two less disaster damage. Moving this room doesn’t require an action. 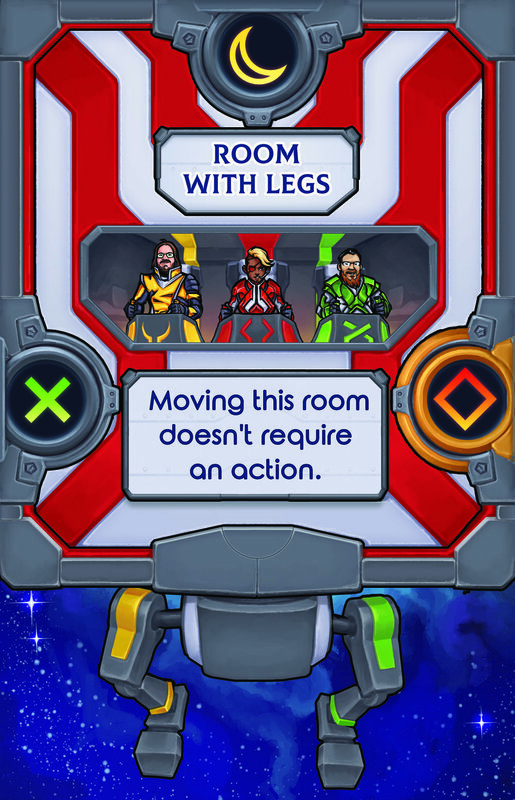 Additional notes: Room With Legs still has to have it’s right connection met for you to be allowed to move it. 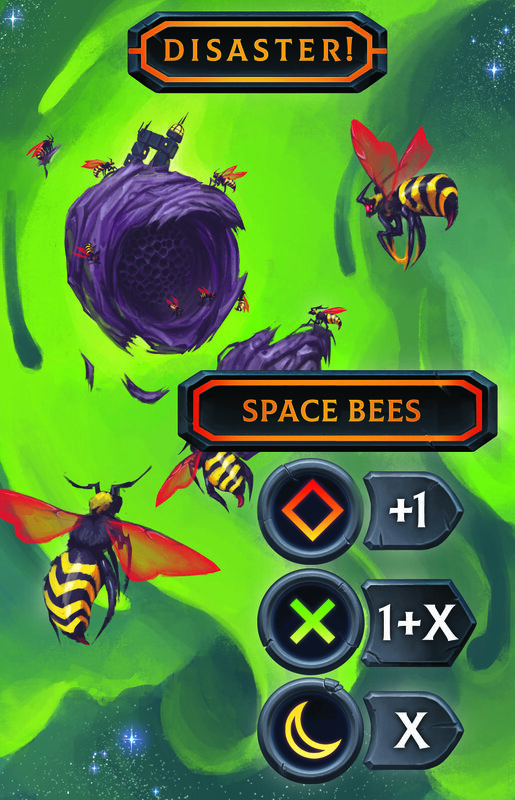 If you want to use this effect you have to do so before you take a card from the shop or take an action. Before you place or move this, rotate it. Before you place this you may swap it with one of your rooms. 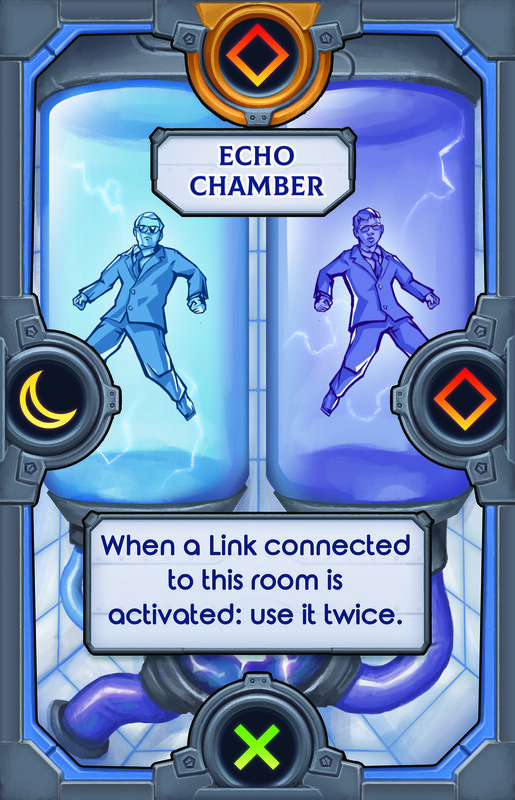 Additional notes: When using this effect, choose the room that you wish to swap with the Warping Chamber. 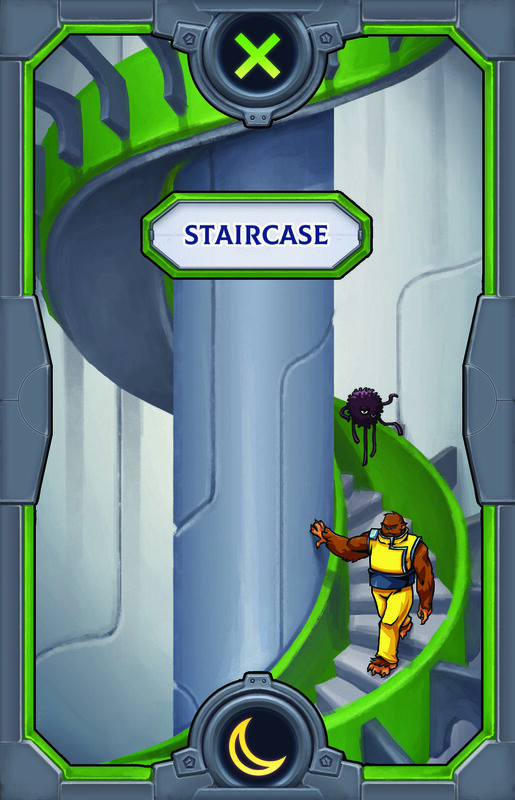 Lift the room out of you castle. 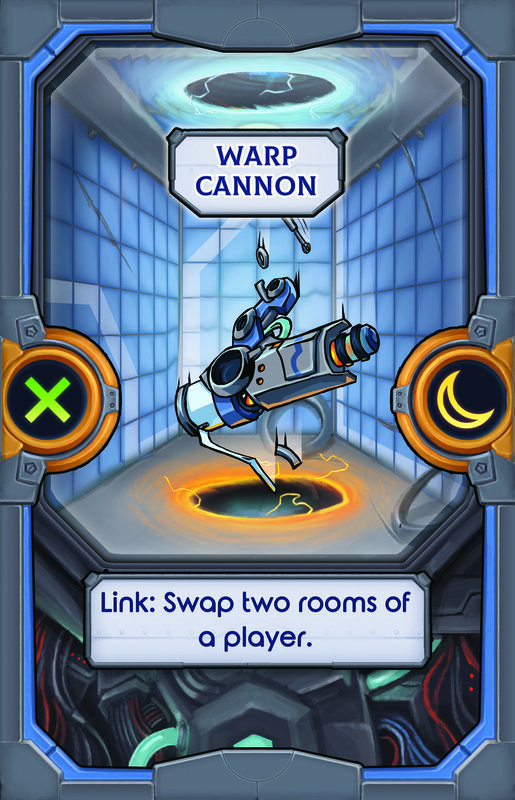 Place the Warping Chamber in the rooms location. 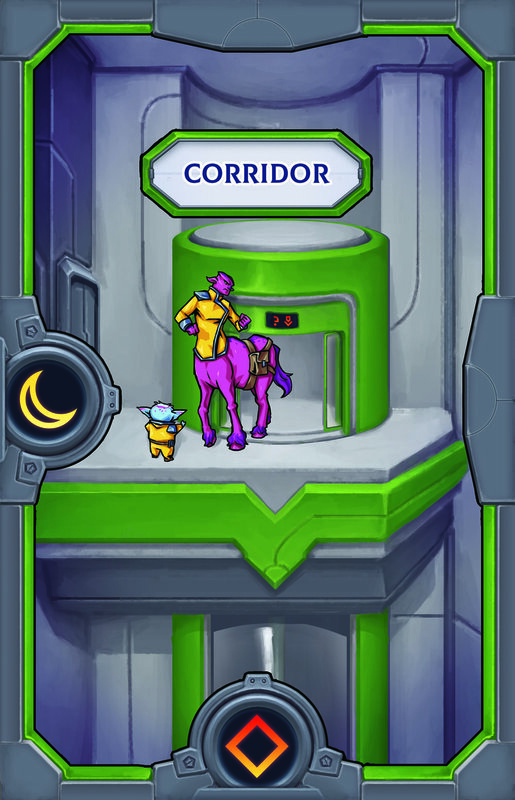 Then you may place the lifted room anywhere you can. As always, placement rules must be respected at all times. You may place this in any players castle. Additional notes: This includes your own and other players castles. As always, placement rules must be respected at all times. At the start of your turn, take an action for free. 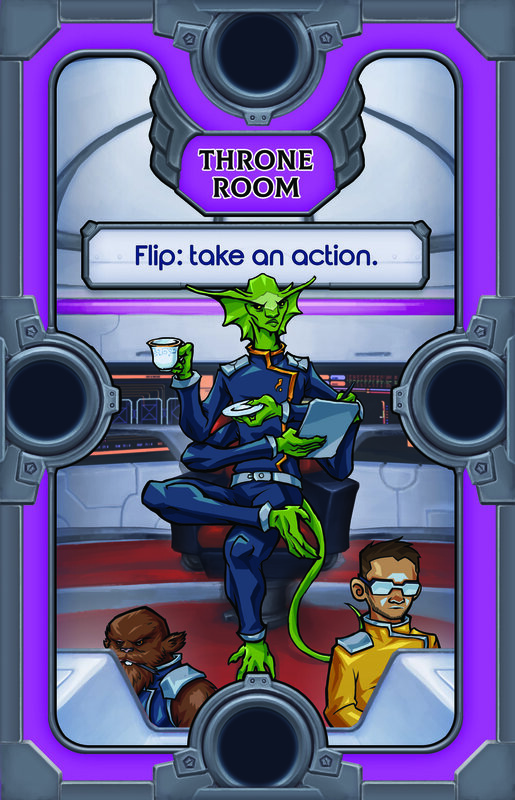 Additional notes: You may use this effect to use an action room and/or a basic action. You may still use an action instead of placing a card from the shop. This action doesn’t have to be different from the free action used. 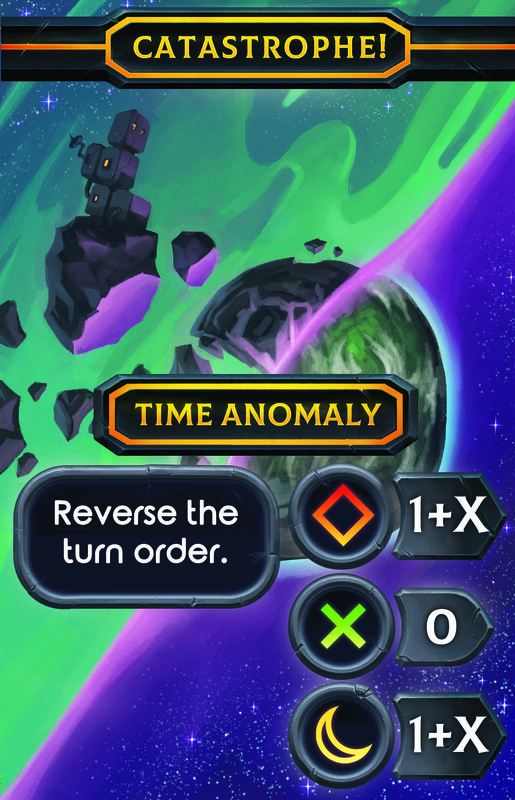 If used in conjunction with Nuclear Generator you may only use a total of 3 actions in a turn, the free action can’t be duplicated. 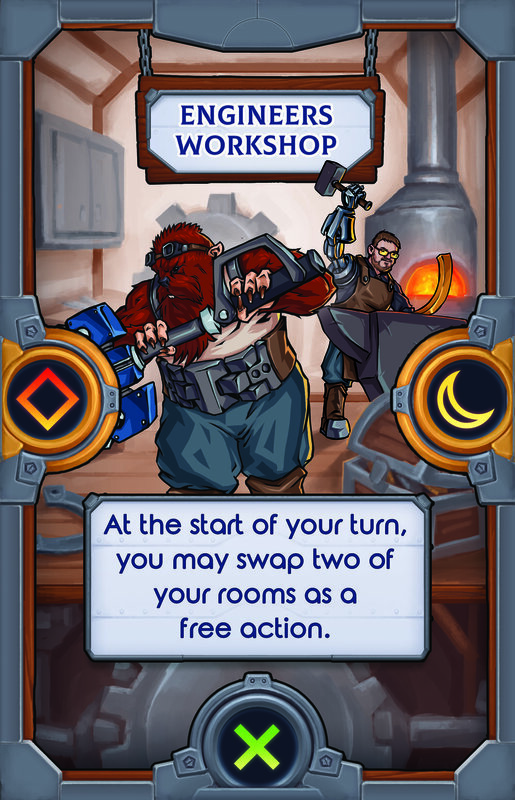 At the start of your turn, you may swap two of your rooms as a free action. Additional notes: You may still use an action instead of placing a card from the shop. This action doesn’t have to be different from the free swap action used. 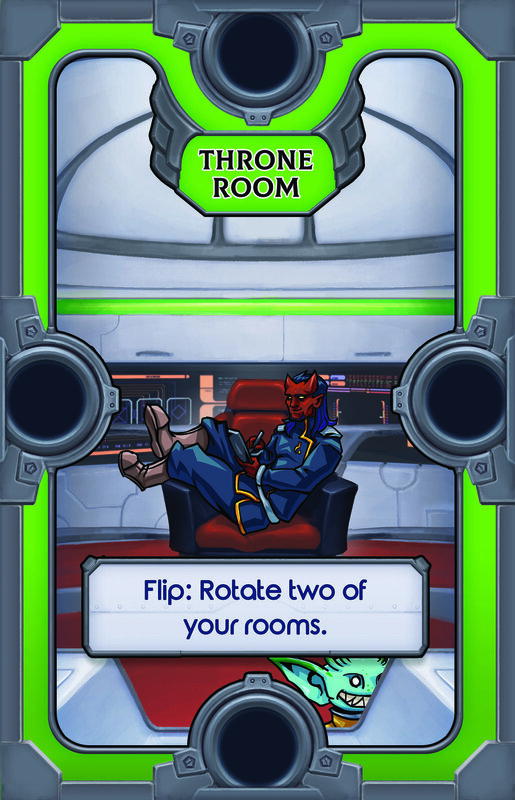 At the start of your turn, move a room for free. Additional notes: You may still use an action instead of placing a card from the shop. This action doesn’t have to be different from the free move action used. 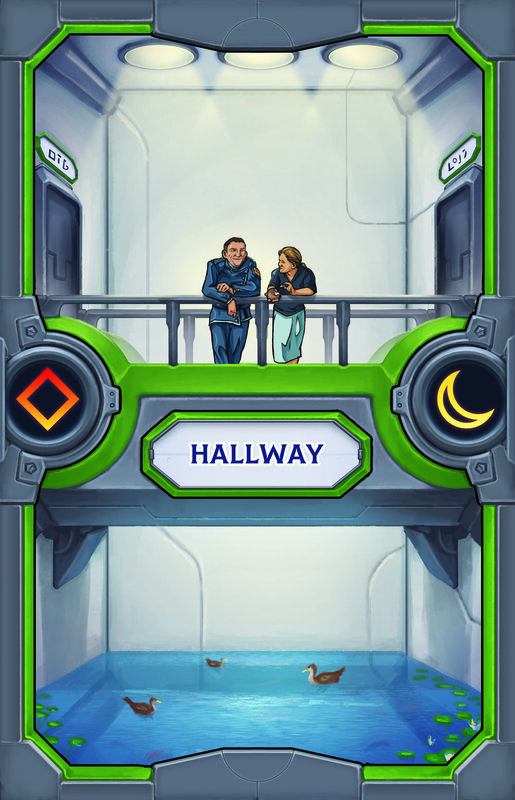 Connected rooms can’t be manipulated. Additional notes: The Candy Shop can still be manipulated. 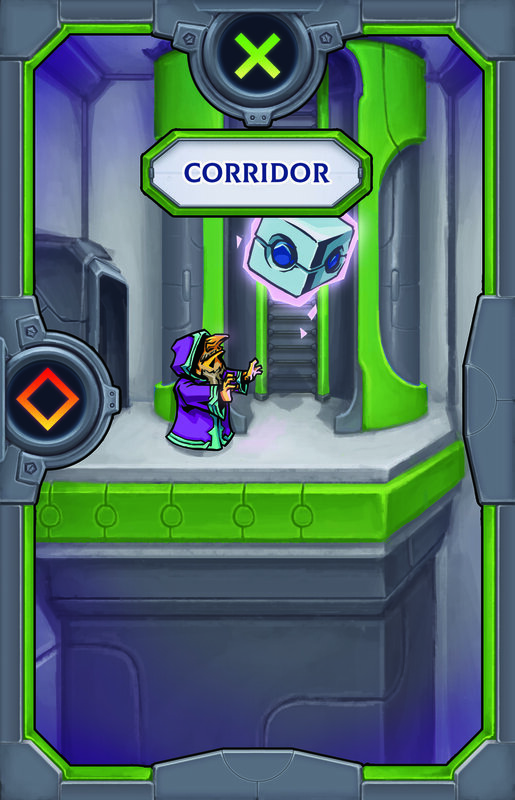 The connected rooms can’t be manipulated by any player, including yourself. Additional notes: The Swimming Pool can still be manipulated. 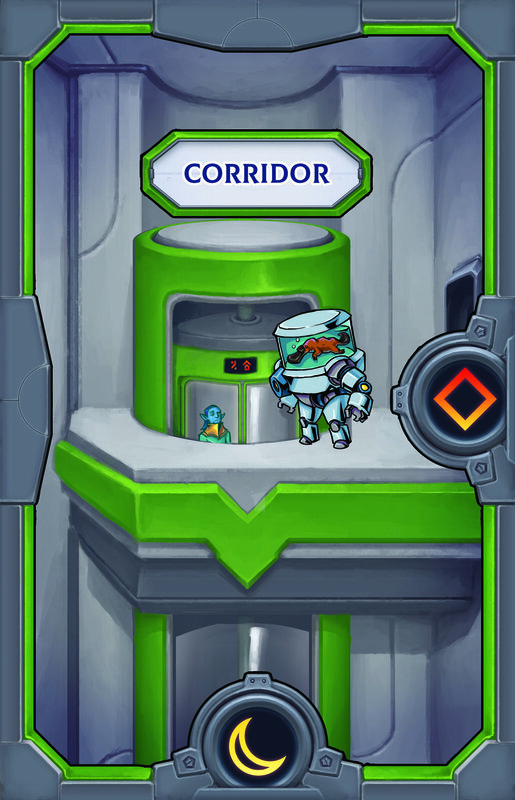 The connected rooms can’t be manipulated by any player, including yourself. 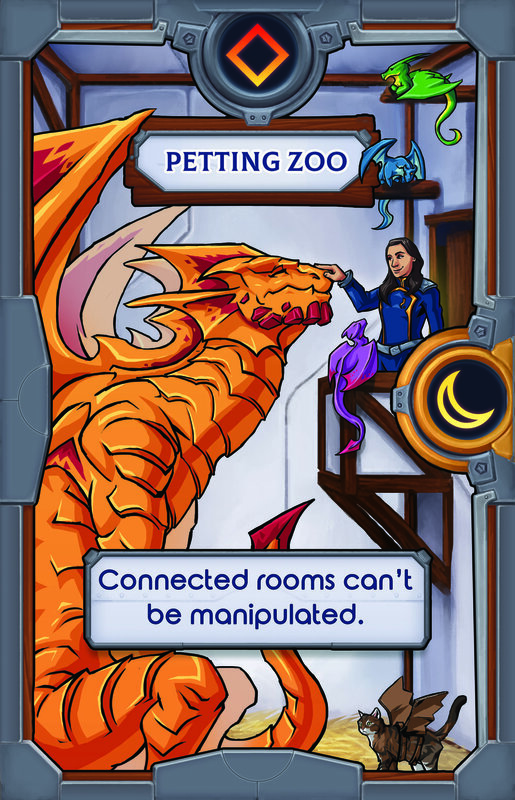 Additional notes: The Petting Zoo can still be manipulated. 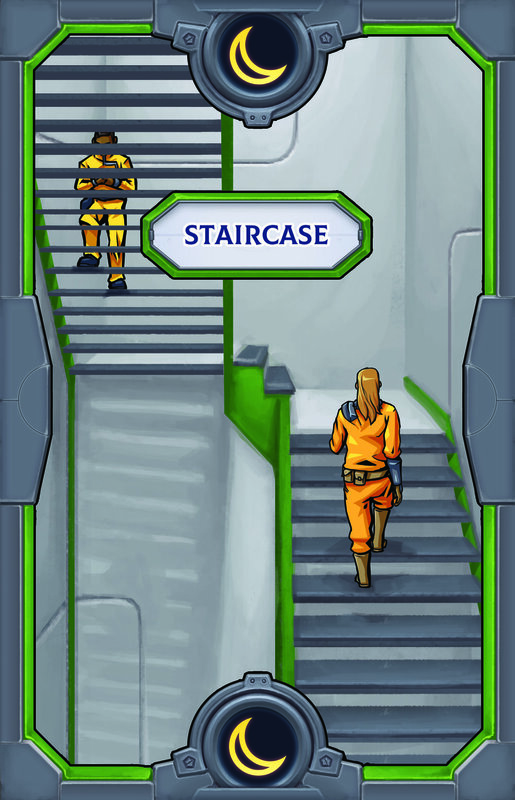 The connected rooms can’t be manipulated by any player, including yourself. 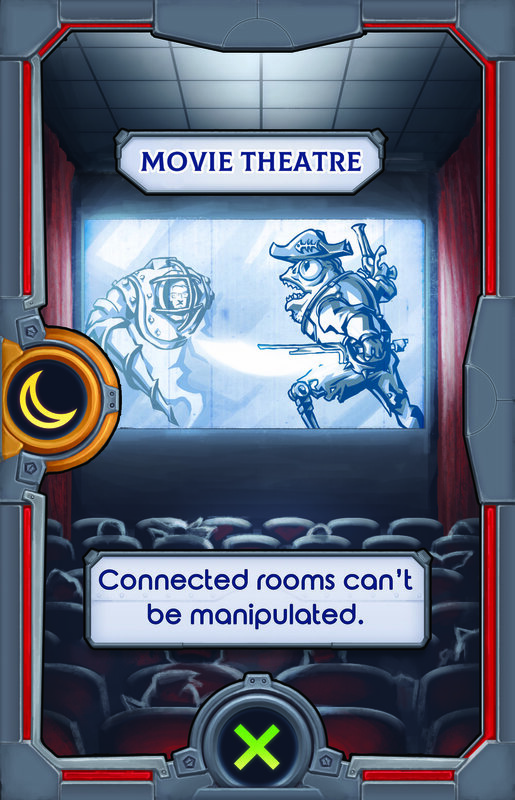 Additional notes: The Movie Theatre can still be manipulated. 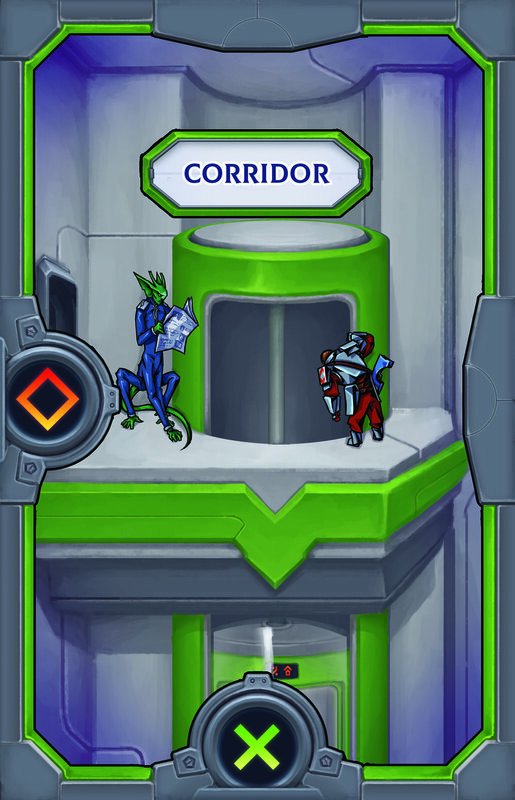 The connected rooms can’t be manipulated by any player, including yourself. You may take two different actions a turn. 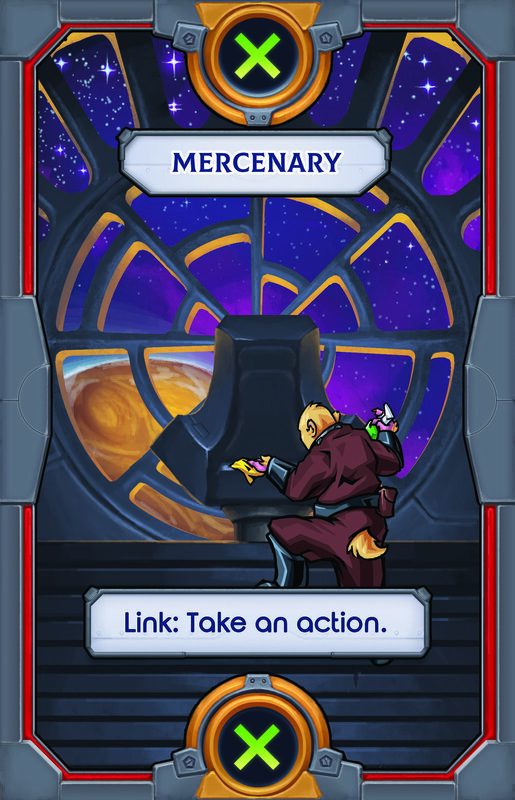 Additional notes: When you use an action during your turn you may use another, different action. 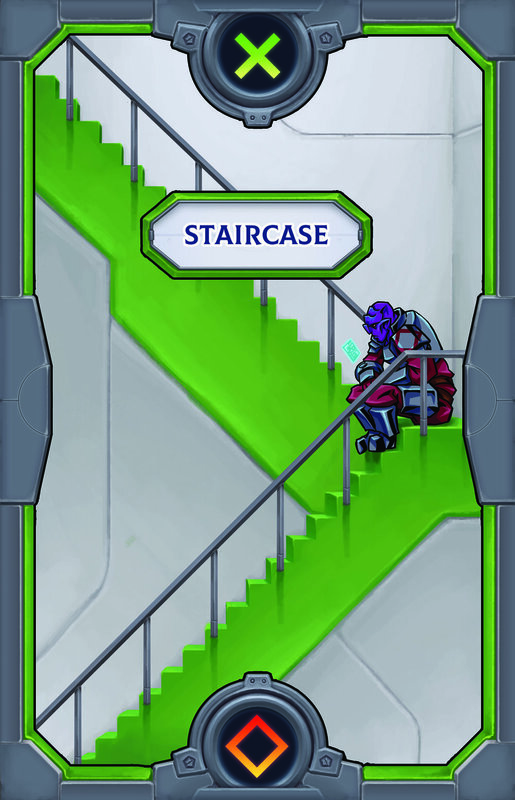 This effect only applies if you use an action, it doesn’t allow you to take a second card from the shop. 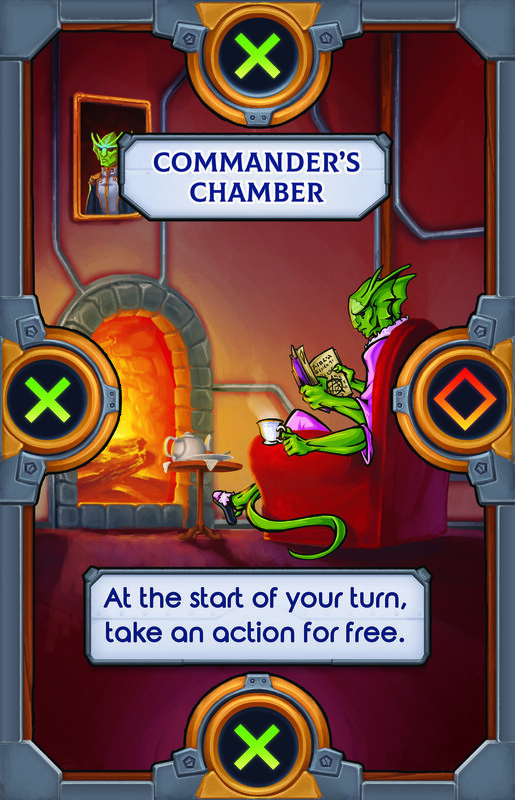 This card doesn’t allow you to take addition actions with Commanders Chambers or Mercenary. 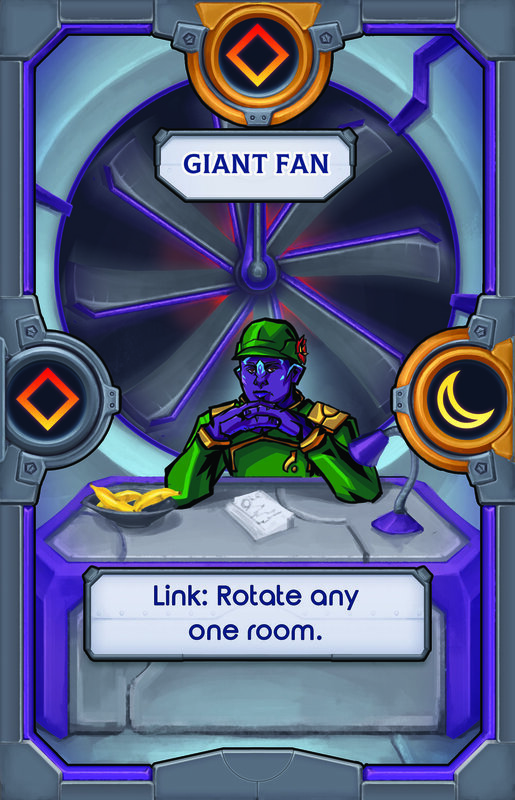 Additional notes: You may use action rooms with this effect. Link: Rotate any one room. 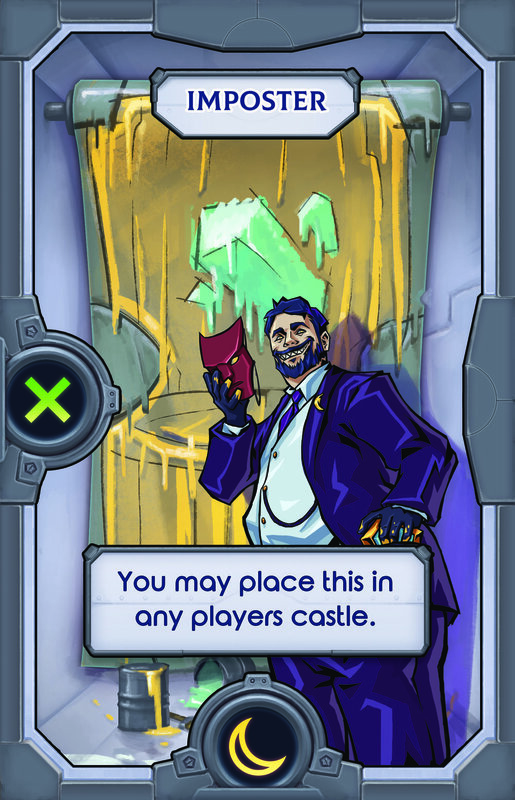 Additional notes: You may rotate a room in your own or any other players castle. As always, placement rules must be respected at all times. 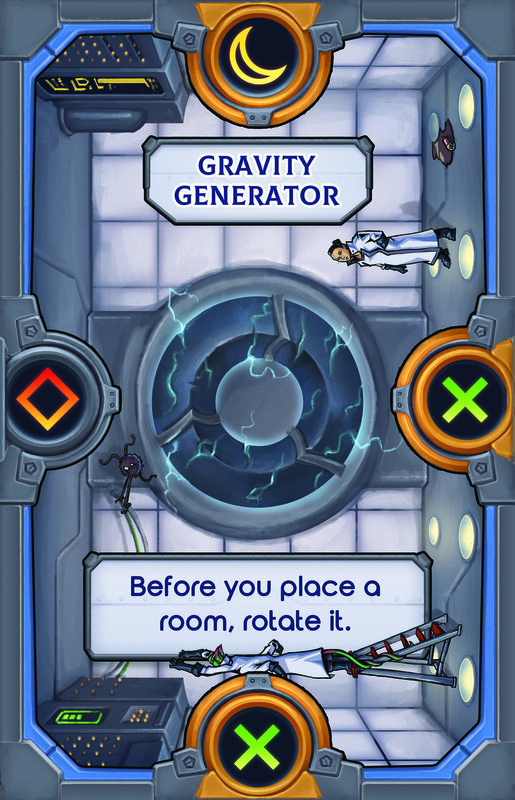 Link: Swap and rotate 2 of your rooms. 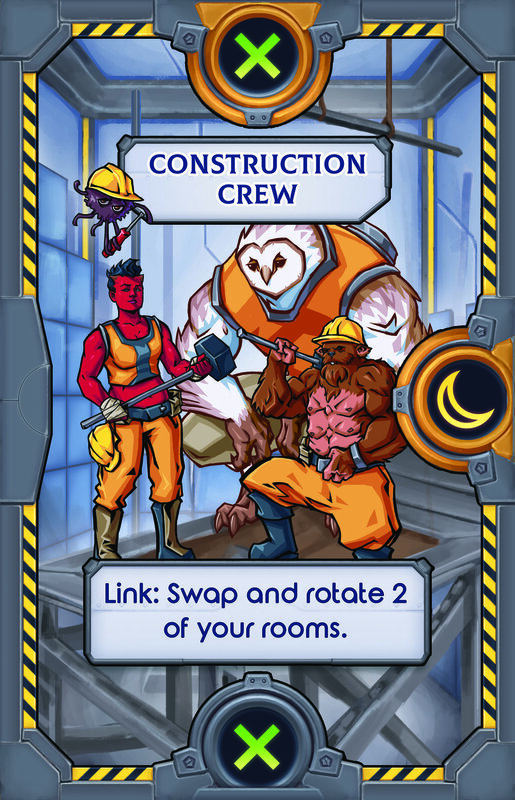 Additional notes: You may swap the two rooms and then rotate them before placing. Placement rules only apply after the rotation has finished but must be respected from that point. 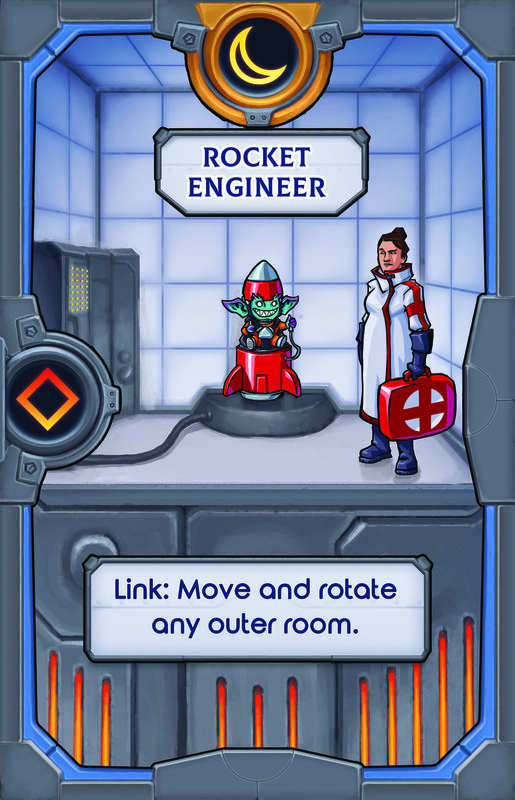 Link: Move and rotate any outer room. Additional notes: You may move the room and then rotate it before placing. Placement rules only apply after the rotation has finished but must be respected from that point. 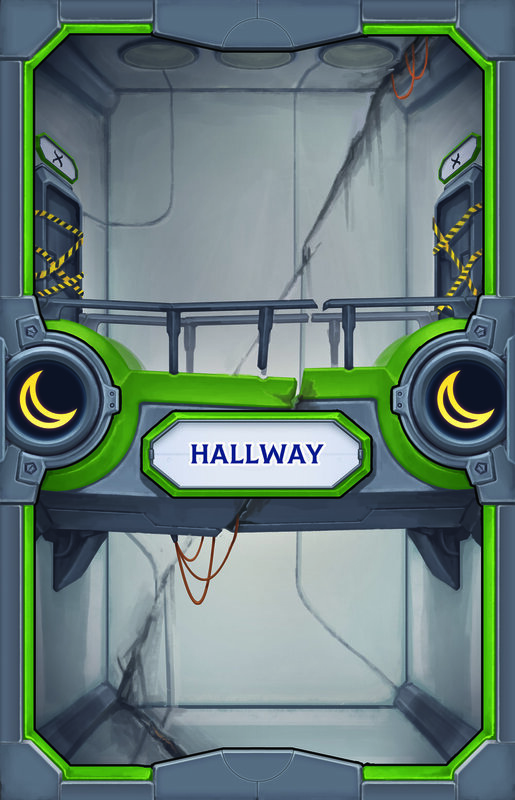 You may use this effect on any of your or any of your opponents outer rooms. Link: Move up to two outer rooms. Additional notes: The rooms have to be moved one after another. For example a room 1 is not an outer room because it’s connected to an outer room 2. You may move the outer room 2, which then makes room 1 an outer room. You may then move room 1. You may move rooms in any players castle, including your own. The two rooms don’t have to be in the same castle. 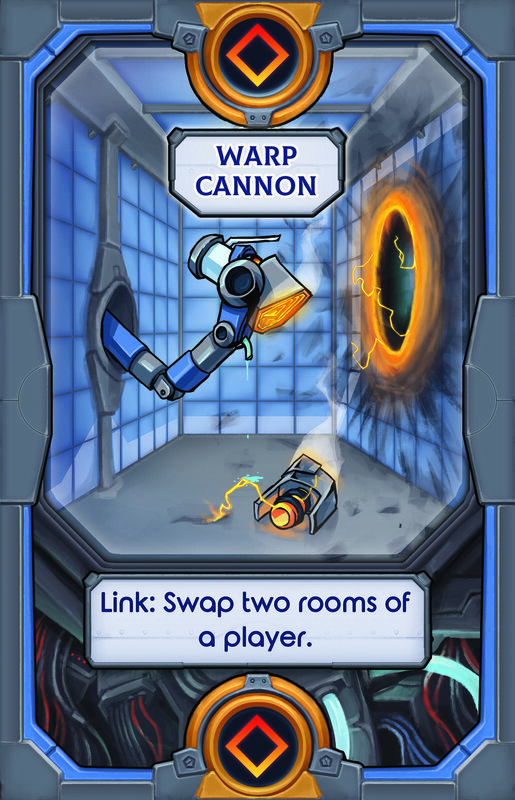 Link: Swap two rooms of a player. 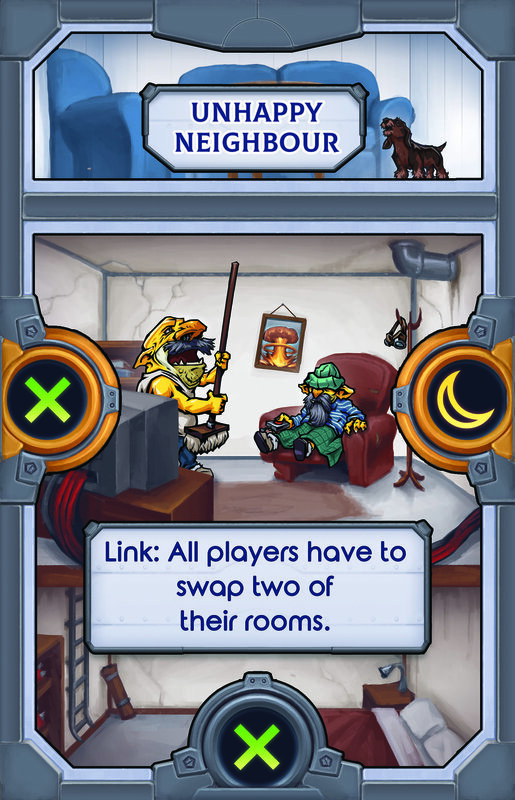 Additional notes: You may swap rooms in any players castle. As always, placement rules must be respected at all times. 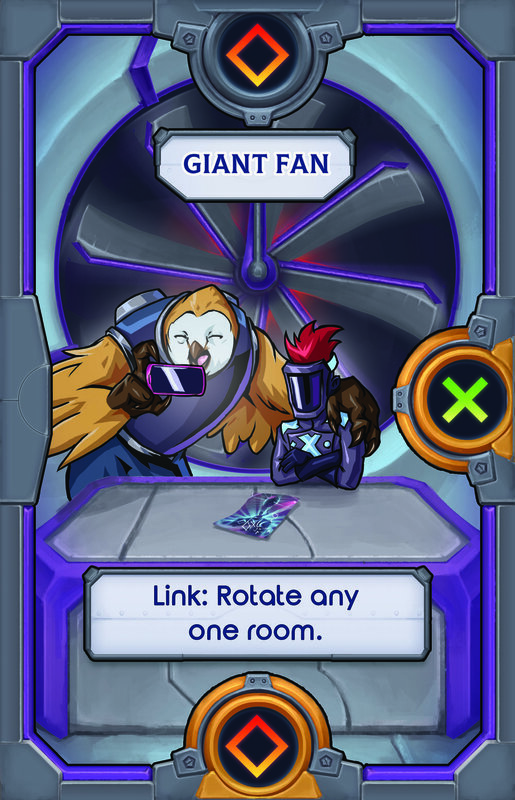 Link: Look at the top card of the deck. If you can place it in your castle, do so, if not, discard it. 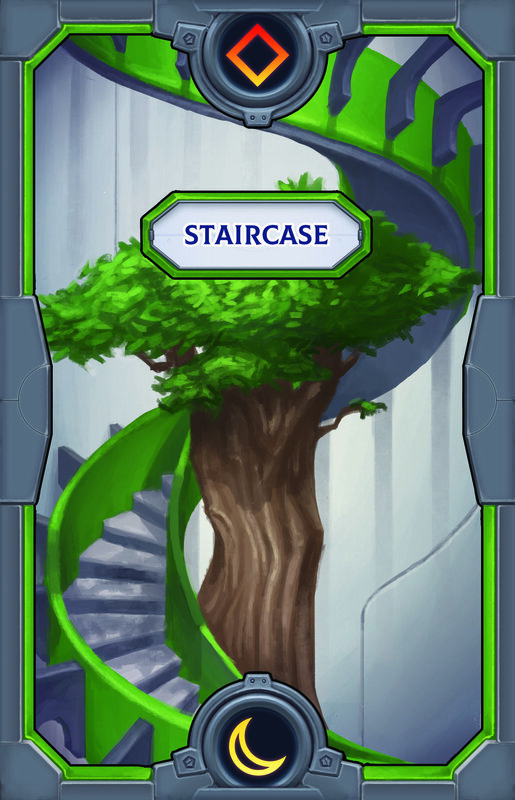 Additional notes: You don’t have to use this effect but if you look at the top card of the deck and can place it, you have to. If a Disaster is drawn, play it. 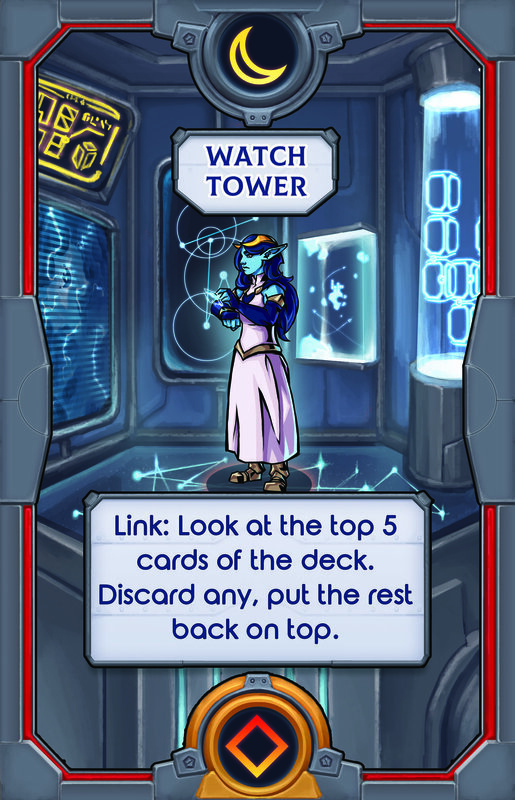 Link: Look at the top 5 cards of the deck. Discard any, put the rest back on top. Additional notes: You may put them back in any order. 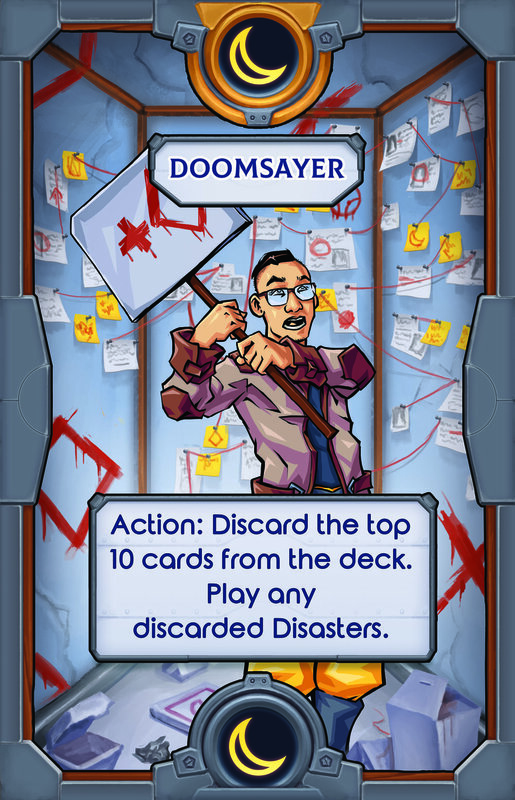 Play any Disaster that has been discarded. 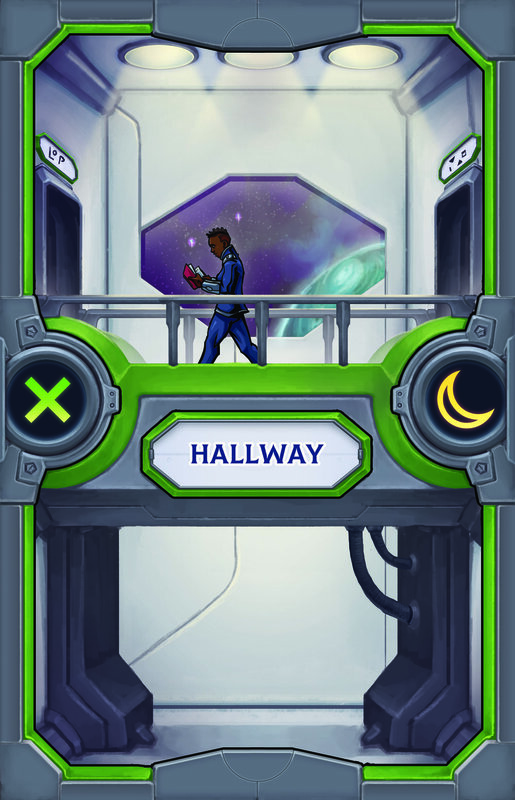 Additional notes: This essentially allows you to pick up all the surrounding cards and place them again in any positions you like. As always, placement rules must be respected at all times. 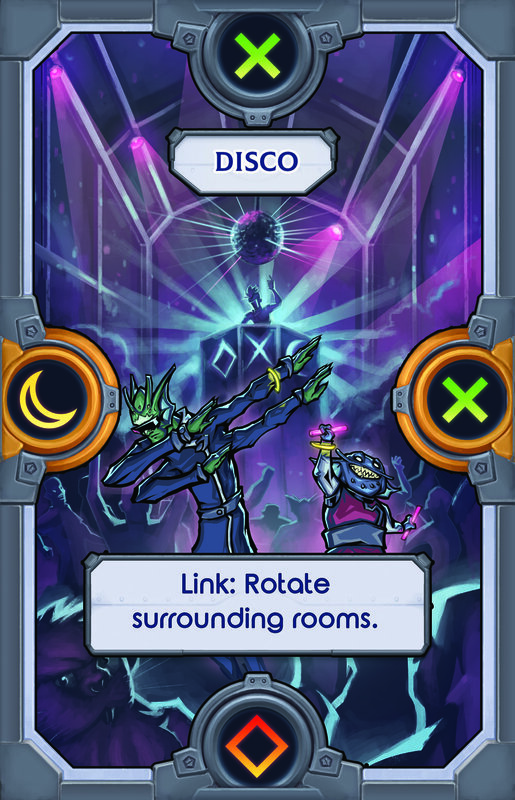 This can be used to trigger Link effects again. 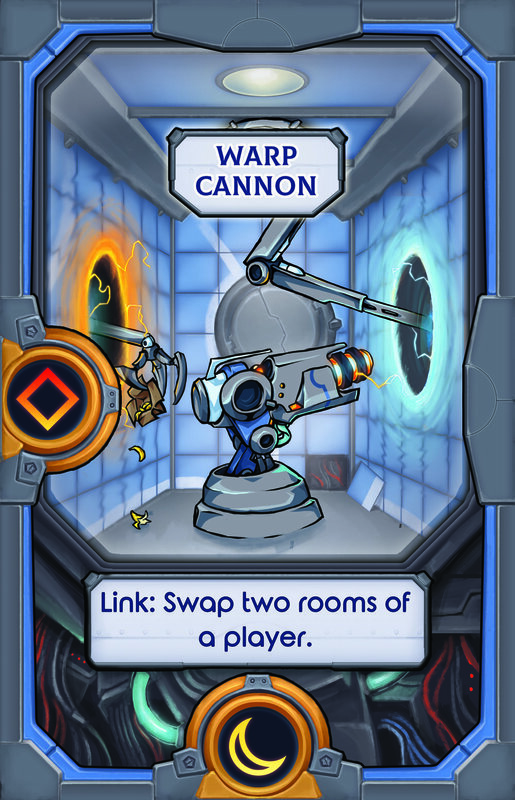 Link: All players have to swap two of their rooms. 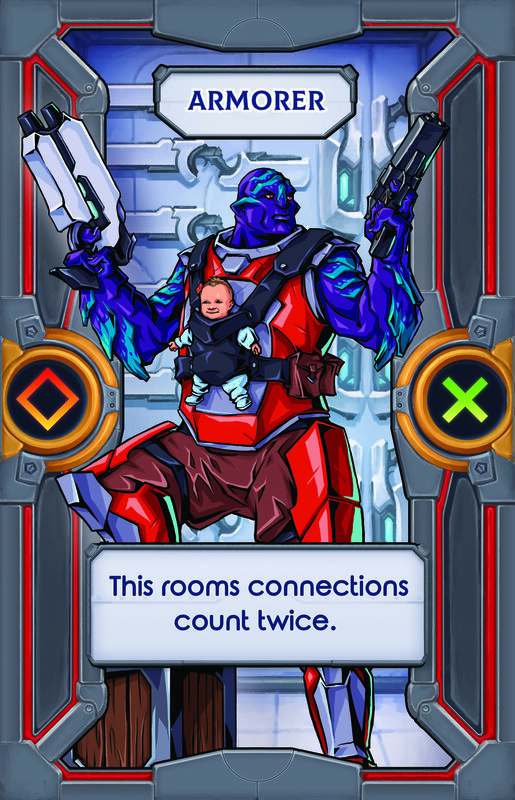 Additional notes: If a player can’t swap rooms without breaking placement rules, they don’t have to. 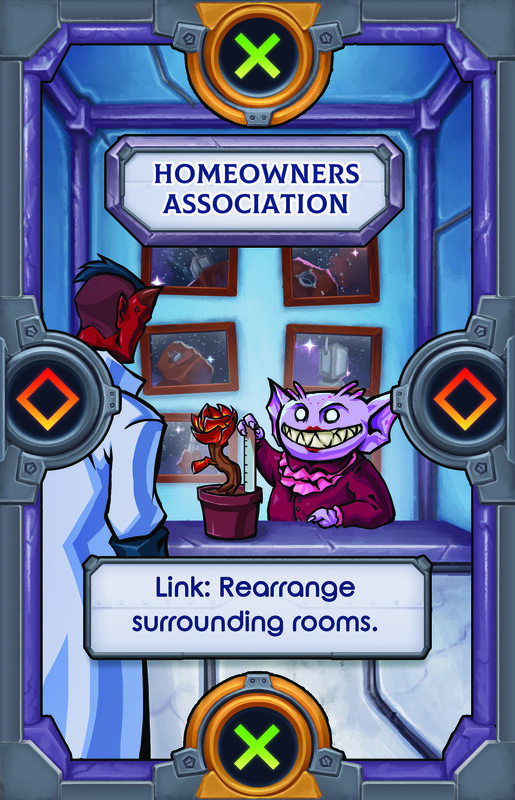 Link: You have to add the to card from the deck to the shop this round. 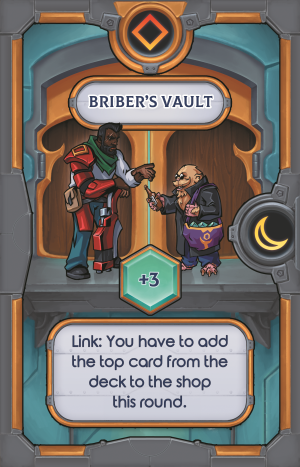 Additional notes: Add an additional card to the shop this round. Additional notes: This overrides Generator cards, because negative effects override positive ones. Worth one treasure for each surrounding rooms. You can’t manipulate this room or surrounding rooms. Worth the amount of rooms on the shortest path between this and the Throne Room. If you block all Disaster damage from this you have to sacrifice 2 rooms. Additional notes: You may choose any two rooms to sacrifice. All players can only take actions this round. Discard the Shop as normal. 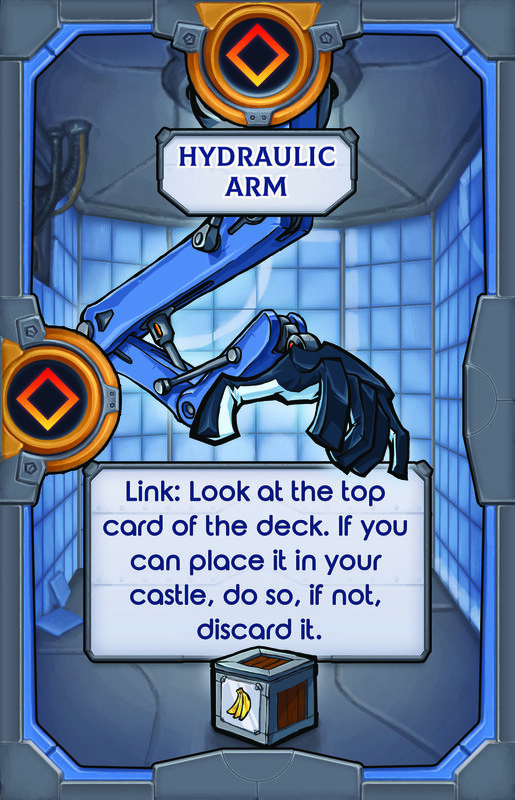 Discard the top 10 cards from the deck. 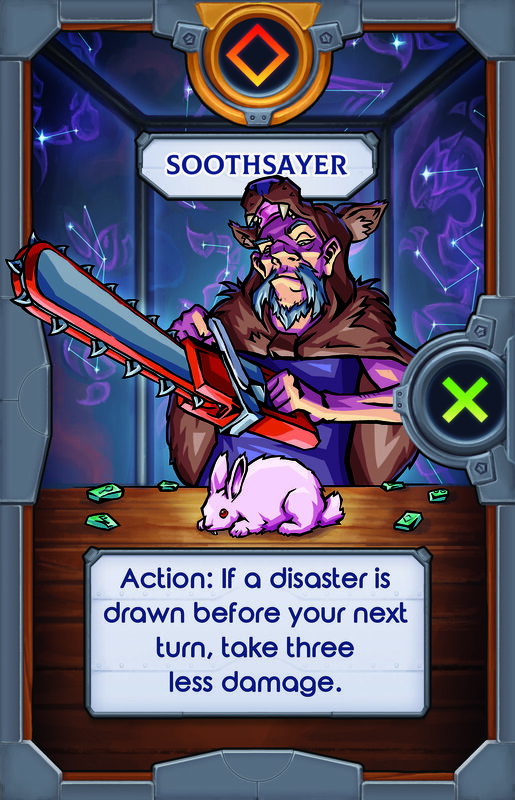 Additional notes: Play any Disasters that got discarded. 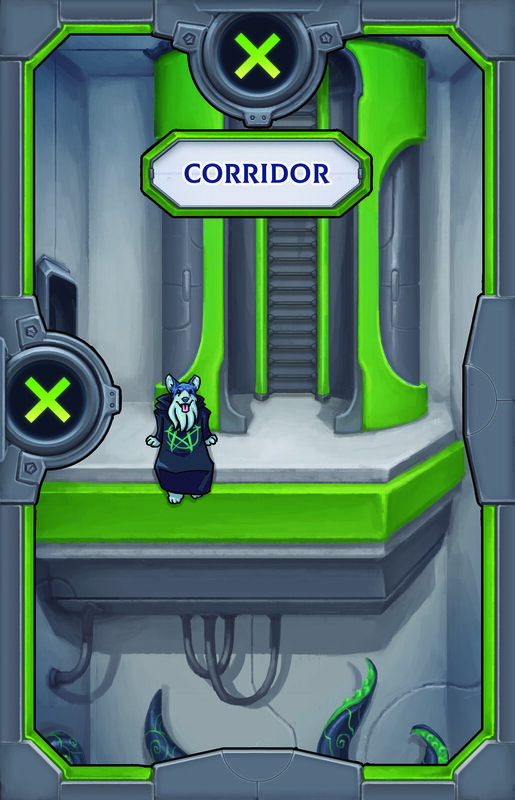 All players have to pass an outer room to the player on their right. 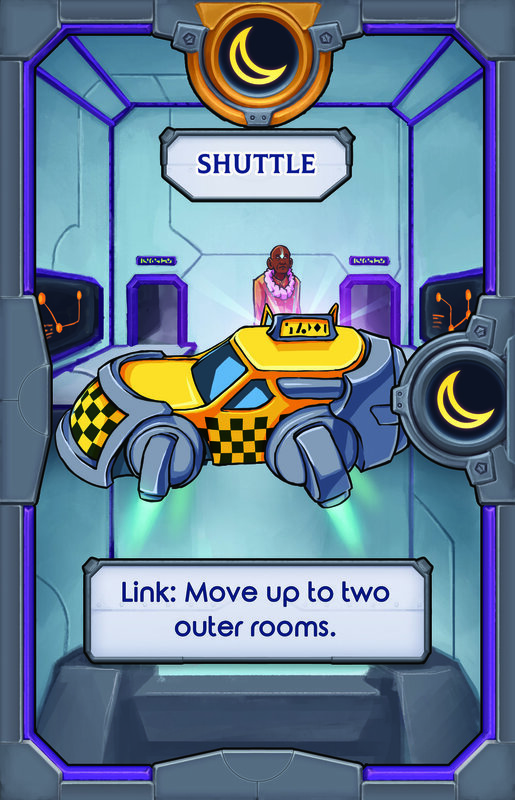 Additional notes: You don’t have to choose a room the player you’re passing it to can place. If they can’t place it, discard it. This effect overrides “can’t be manipulated” protections. This Disaster’s damage can’t be reduced. 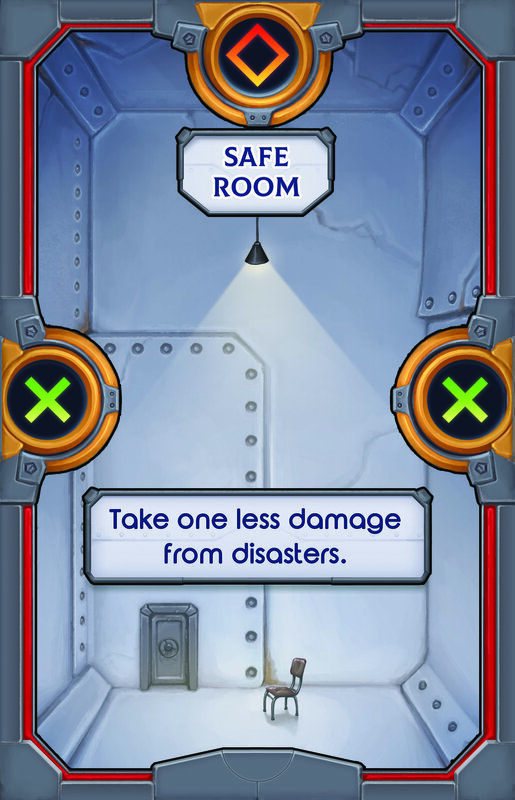 Additional notes: This means that no rooms that reduce damage can be used (Safe Room, for example), although connection points still count as damage reduction. 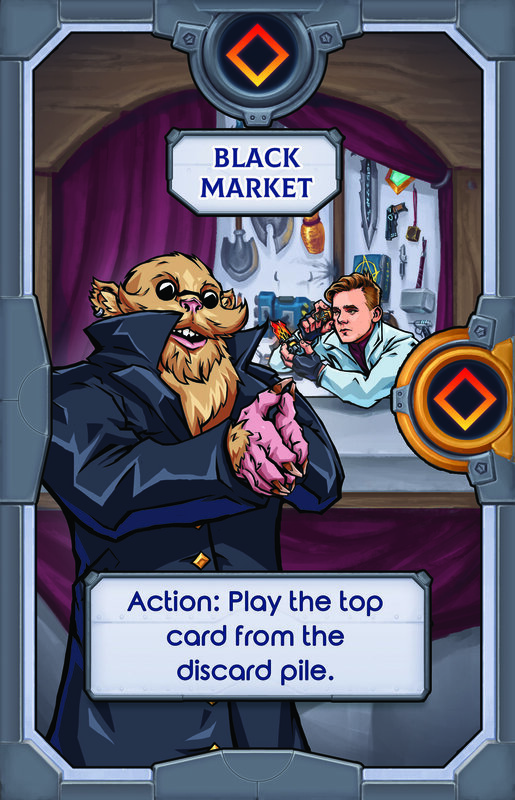 Additional notes: Discard the whole shop at the end of the round. Future shops only have 5 cards again. 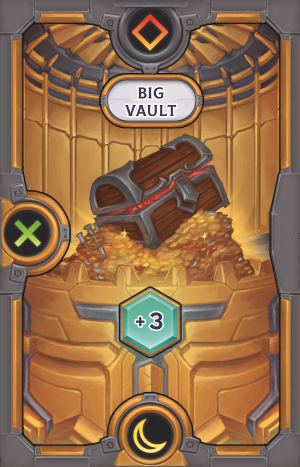 Does 1 extra X damage for each active vault. Additional notes: The bonus damage is calculated on a player by player basis. 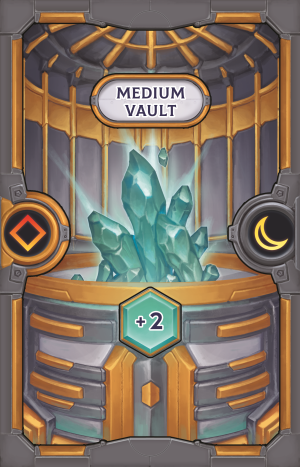 It isn’t based on the combined amount of active vaults of all players. Different players can take different bonus damage. Shuffle another Disaster into the deck. Additional notes: This is intended to be a Disaster but if you want it to be more challenging you can shuffle a Catastrophe instead. 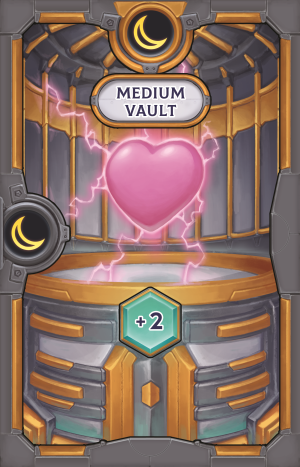 When this is played every player may discard the top 5 cards from the deck. Additional notes: Play any Disasters discarded. 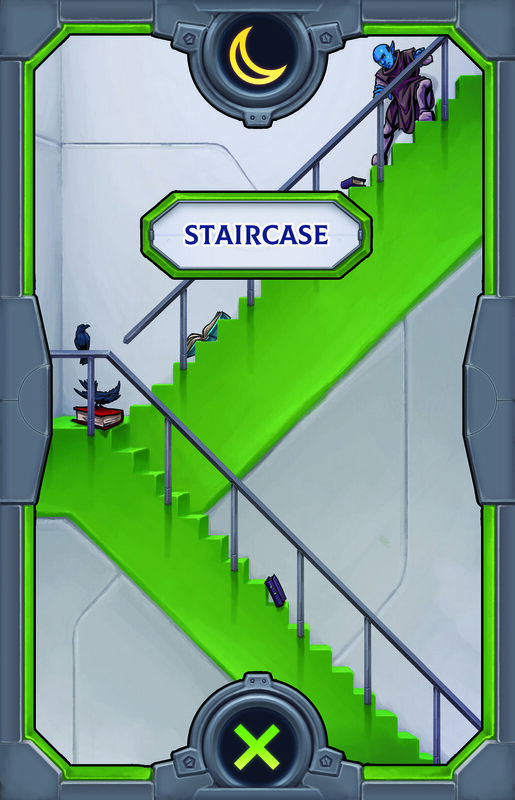 All players may rotate a room of the player to the left. All players have to sacrifice one room. 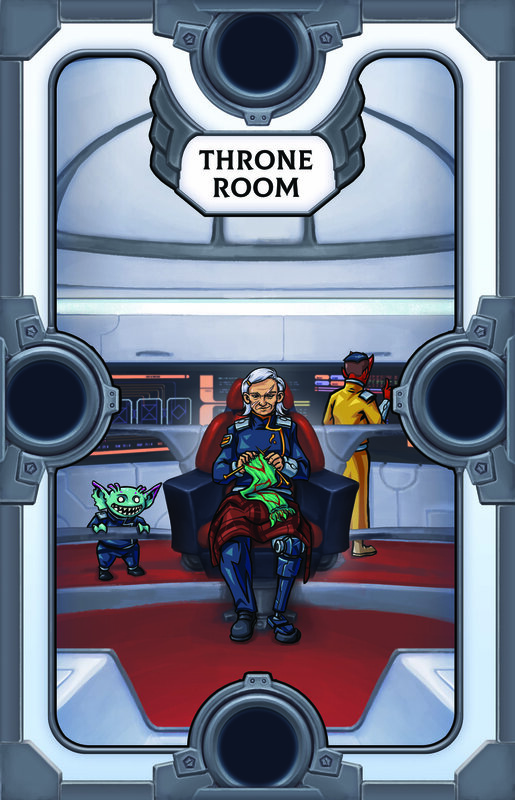 There are ten different coloured throne rooms. They all have different colours, but function the same. 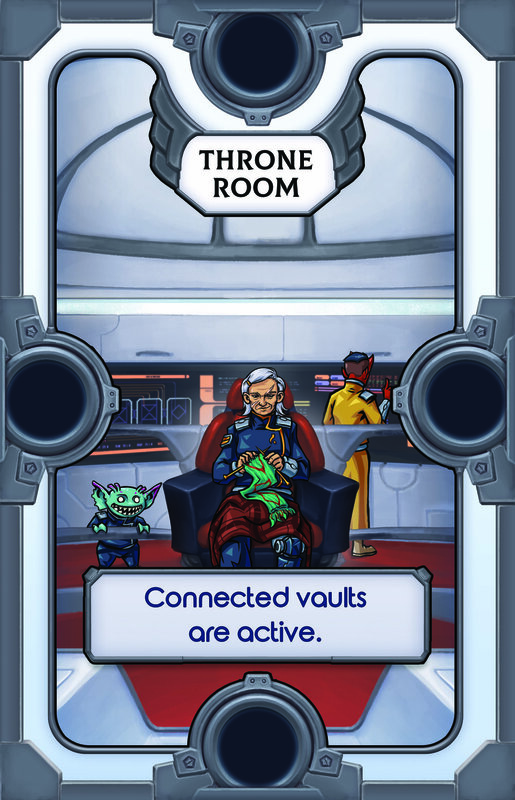 Throne Rooms automatically match any connection that is place at them. Flip: Rotate two of your rooms. Additional Notes: You may use an action room as well as basic actions. 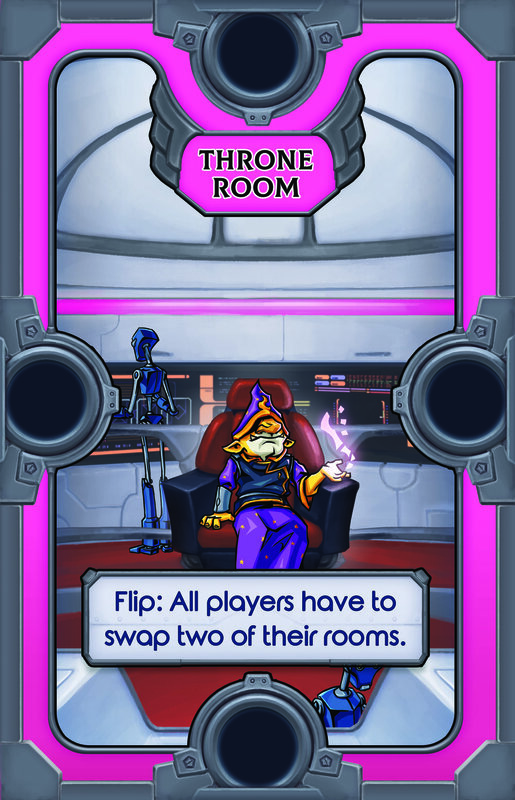 Additional Notes: The Throne Room can still be manipulated. Flip at any time: Prevent two disaster damage. Additional Notes: You may use this effect even if it isn’t your turn. It only applies for a single Disaster. 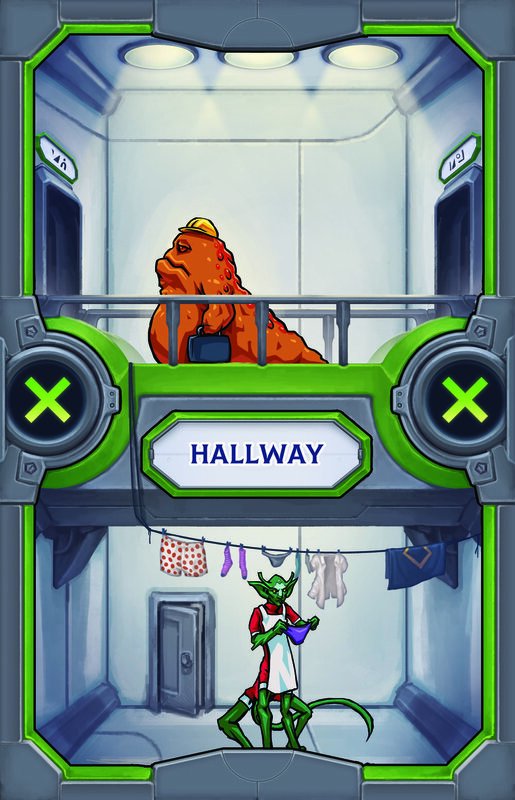 Flip: All players have to swap two of their rooms. 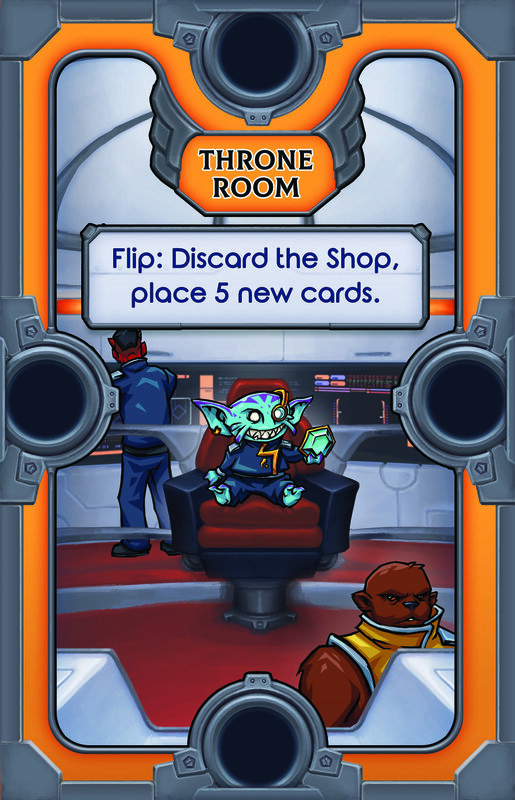 Flip: Discard the shop, place 5 new cards. Additional Notes: Play any Disasters drawn. 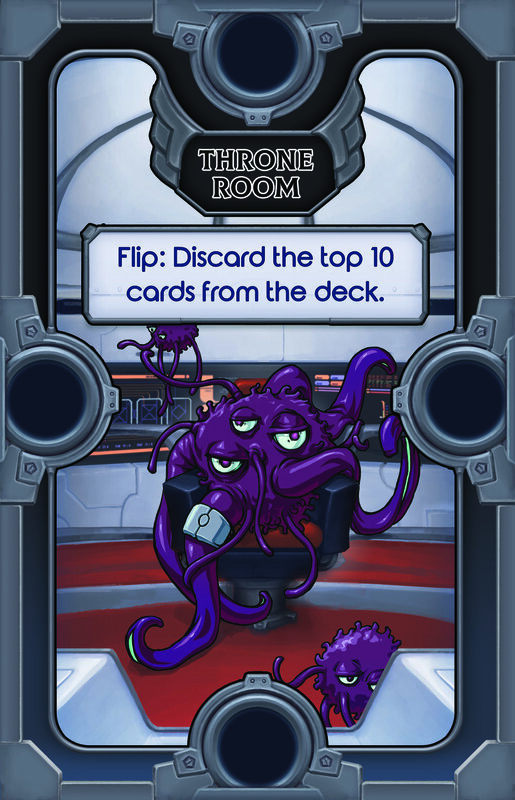 Flip: Discard the top 10 cards from the deck. Additional Notes: Plaz any Disasters drawn. When you move a room you may rotate it. Additional Notes: Placement rules must still be respected. 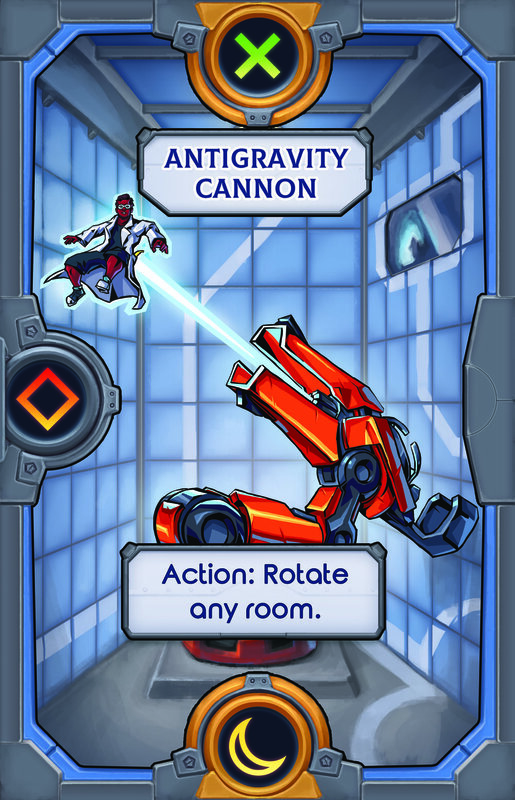 Action: Rotate one of your rooms.